FILE - A young boy leads hard-line Islamist al-Shabab fighters as they conduct military exercises in northern Mogadishu's Suqaholaha neighborhood, Somalia. By most measures, Africa is safer today than it has been in the modern era: Diseases are less deadly and wars are less frequent. But recent years have also been marked by a rise in radical extremism on the continent, and the terror threat could derail some of the world's fastest-growing economies. Dealing with the spread of radicalization has been a central focus of U.S. President Barack Obama's foreign policy during his time in office. Few areas have been spared over the past eight years, with much of the continent living in the shadow of a violent extremist group: al-Shabab in Somalia and East Africa, Islamic State (IS) in Libya, al-Qaida in the Islamic Maghreb (AQIM) in Mali, the Lord's Resistance Army in central Africa, and Boko Haram in Nigeria. FILE - Libyan forces allied with the U.N.-backed government walk through a destroyed building during a battle with Islamic State militants in Sirte, Libya, Oct. 2, 2016. The Obama administration has searched for answers to this problem with varying degrees of success. Obama's military strategies included aerial bombardment, intelligence assistance, logistical support and training missions. A militarized foreign policy isn't what many of the president's supporters in Africa or at home wanted when he took office, but it is what Obama determined was necessary. "We've seen this terror threat grow, and the administration response has been to ramp up [military-to-military] cooperation to continue and enhance drone strikes so there's new drone bases in a number of countries on the continent that didn't exist before the Obama administration," said Joshua Meservey, policy analyst specializing in Africa and the Middle East at the the Heritage Foundation. "So that's been a central thrust of his foreign policy. Perhaps, yes, that is a disappointment to some on the continent who were hoping for what is termed as a more equitable relationship." In Somalia, the U.S. has offered training to African Union troops fighting the al-Shabab insurgents as well as to Somali National Armed Forces preparing to take over security responsibilities in the fragile country. In Libya, the U.S. assisted with an aerial campaign in the last quarter of 2016 to degrade the abilities of IS in the city of Sirte and other strongholds. 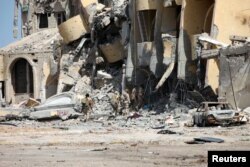 This came several years after the U.S. and NATO allies participated in the ouster of Libyan President Moammar Gadhafi. FILE - A Cameroonian soldier walks in the Cameroonian town of Fotokol, on the border with Nigeria, on Feb. 17, 2015, after clashes occurred Feb. 4 between Cameroonian troops and Nigeria-based Boko Haram insurgents. 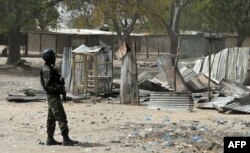 In Nigeria, the U.S. has offered intelligence support, equipment, advice and training in the fight against Boko Haram. In central Africa, 100 U.S. military advisers have been deployed in an unsuccessful search for the warlord Joseph Kony. "The U.S. has deepened its military engagement with Africa," said Alex Vines, head of the Africa Program at U.K.-based Chatham House. "Under [former President] George W. Bush there was the launching of the U.S.-Africa Command, a dedicated command focusing on Africa, and so the Obama administration has just really continued that trend." Vines said the U.S. model is not to have large bases on the continent, which are costly and unpopular. The strategy is more about finding ways to perform counterterrorism operations that leave a small footprint. Preferred strategies are those that rely on drone or aerial strikes or those that can be termed force multipliers, such as sharing intelligence and providing training. Perhaps the most high-profile U.S. military engagement with the continent came during the Ebola outbreak of 2014 when the U.S. sent about 2,800 soldiers, in addition to doctors and aid workers, to build treatment units, treat patients and contain the spread of the virus in Liberia. 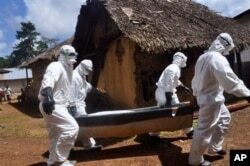 FILE - Health workers carry the body of a woman suspected of contracting the Ebola virus in Bomi county situated on the outskirts of Monrovia, Liberia, Oct. 20, 2014. "Hundreds of thousands, maybe a couple million lives were saved," Obama said during his 2016 State of the Union address. "When we help African countries feed their people and care for the sick, it's the right thing to do, and it prevents the next pandemic from reaching our shores." It is unclear what President-elect Donald Trump has planned for Africa in terms of military partnerships. During the campaign, Walid Phares, a Lebanese-American foreign policy analyst and adviser to Trump, said that Africans can expect a stronger commitment to fighting terror than that shown by Obama. "Africans like Obama, for sure, but his foreign policy was not good for Africans, and Sahel countries feel they were not part of this policy," Phares said. "They would rather go now with a Trump administration. Without security, there is no economy." But the U.S. has been far from absent in the Sahel. Since 2005, the U.S. has led the Trans-Sahara Counterterrorism Partnership that works with Sahel countries including Burkina Faso, Cameroon, Chad, Mali, Mauritania, Niger and Senegal to build military capacity to fight terror and transnational crime. FILE - A Nigerien soldier takes a position during Flintlock 2014, a U.S.-led international training mission for African militaries, in Diffa, March 6, 2014. 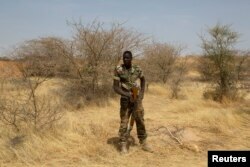 Each year, the U.S. holds an annual counterterrorism exercise, Flintlock, in a Sahel nation. In February 2016, the U.S. gave $71 million in equipment, logistics support and training to the militaries of the countries in the Lake Chad Basin for fighting Boko Haram. This followed $85 million in other programs designed to help these countries improve border security and defeat the terror group. In 2016, the U.S. also opened a drone base in Niger to offer surveillance of illicit activity in the Sahel. Meservey said he expects a large degree of continuity when it comes to U.S. military assistance to African countries under Trump. Many countries that receive large amounts of military aid are fighting groups that pose a threat to the United States, as well. A Trump administration is unlikely to want to hamper that effort. If there is a change in Trump's strategy, it may be an emphasis on reciprocity and holding partner nations more accountable, one analyst said. "We might see more demands, perhaps, on recipient countries of this military aid," Meservey said. "Now these countries do contribute. Oftentimes, it's with manpower — that's what they have and they can contribute — and the U.S. contributes funds and training and material so that we might see more demands made of the countries. "There are lots of bad ways to deliver military aid and there are good ways to deliver it," he added. "So there can be debates within how you deliver aid or whether you're supporting responsible militaries. So those are the debates that should be had, and they should be ongoing."